Grand Rapids, MI, May 02, 2018 – Spring has sprung and it’s time to think about deck building and life outdoors. To help keep homeowners safe, CAMO is joining the efforts of the North American Deck and Railing Association (NADRA) during Deck Safety Month® in May to promote deck safety. National Nail’s CAMO deck fastening systems include revolutionary CAMO Edge Fastening that drives the fastener into the side of the boards and the joist, as well as face fasteners and clips for a variety of ways to fasten the substructure and deck boards. National Nail’s CAMO supports NADRA’s Deck Safety Month(R) to provide tips to keep decks safe. With the strongest fasteners on the market, National Nail features face fasteners, clips and the revolutionary CAMO Edge Fastening (shown here) that drives the fastener into the side of the boards and the joist for added stability. Check the ledger board connection that attaches the deck to the house and for board splitting. Palmer also cited older decks as being particularly at risk, because they may have been built before codes were established. “There are cases where the deck is attached to the house with nails and that is extremely dangerous,” he said. Check out NADRA’s “10-Point Consumer Safety Checklist” for tips on making decks safer at www.NADRA.org. Or, learn more about National Nail’s CAMO deck fasteners at www.camofasteners.com. Be sure to “Like” CAMO at @camofasteners on Facebook and @camodeckfasteners on Instagram. Grand Rapids, MI – National Nail’s CAMO Screw Off! in which hundreds of contractors competed in a deck fastening speed competitions at lumberyards in New England and New Jersey in 2017, will hold the finals at the Northeastern Retail Lumber Association (NRLA) LBM Expo in Providence, Rhode Island on Feb. 14, 2018. The elimination rounds will be held at the Idea Exchange near the CAMO Fasteners booth #226, beginning at 11 a.m. – 3p.m. The “Elite 8” Finalists compete from 3pm – 4pm when the Grand Prize of a Harley-Davidson® motorcycle is announced along with cash prizes. Designed by National Nail to provide hands-on experience with its CAMO Deck Edge Fastening system, the CAMO Screw Off was hosted by CAMO stocking dealers this past summer and fall in a series of deck fastening speed contests. The unique system, comprised of propriety guides, drill bits and fasteners, actually fastens deck boards on the edge, to give decks a more beautiful, barefoot-friendly, fastener-free surface. To make it even more interesting, father and son Bob and Jesse Buzzell of Robert Buzzell Construction in Newton, NH will represent Moynihan Lumber of Plaistow, NH, facing off against each other in the finals! National Nail worked with CAMO stocking dealers to promote event dates, generate contractor interest, and coordinate competition details. A CAMO Screw Off! Dealer Marketing Kit containing banners, flyers, posters, and other promotional material was provided to each participating location. Additional support included logo wearables, regional PR, and social media. CAMO Edge Fastening from National Nail delivers beautiful, fastener-free, Barefoot Approved™ results with virtually any wood, composite or PVC decking. CAMO offers a variety of guides, fasteners, and accessories, as well as a collated system to suit project requirements. For more information or to locate a dealer, visit CAMO Fasteners or call 1-800-968-6245. Be sure to “Like” @camofasteners on Facebook and @camodeckfasteners on Instagram. GRAND RAPIDS, Mich., Feb. 13, 2017 — National Nail announces that it has expanded and updated its warranty on CAMO Edge Deck Screws, which are part of its CAMO Edge Fastening™ system. Designed to meet today’s market demand for cedar, tropical woods, capped composites and capped PVCs (square or grooved, including brands such as Trex®, AZEK®, TimberTech®, Fiberon®, EverGrain®, Wolf® and other similar products), the new and expanded warranty will cover the replacement of deck board products when the replacement of the deck board is directly related to the non-performance of the CAMO Edge Fastening™ system. The CAMO system is not designed for hollow composite or PVC boards, or metal framing systems and the new coverage does not replace decking manufacturer’s responsibilities under their warranties. He adds contractor feedback has been overwhelmingly positive, with dozens reporting the CAMO system enhances their deck installation, making them more beautiful and “barefoot friendly” while providing a faster, easier and less expensive installation. CAMO Deck Screws simply go into the edge of solid or grooved deckboards for fast installation and offer automatic 3/16″ spacing. CAMO edge fastening guides are part of a system designed to work specifically with CAMO Edge Deck Screws and CAMO Driver Bits. To learn more about the new CAMO Edge Deck Screws new limited warranty, visit www.camofasteners.com or call 800-968-6245 and ask for the CAMO Product Manager. AZEK® and TimberTech® are registered trademarks of CPG International LLC and is unaffiliated with CAMO® or National Nail Corp.
Trex® is a registered trademark of Trex Company and is unaffiliated with CAMO® or National Nail Corp.
Fiberon® is a registered trademark of Fiberon and is unaffiliated with CAMO® or National Nail Corp.
EverGrain Composite Decking® is a registered trademark of Tamko Building Products and is unaffiliated with CAMO® or National Nail Corp.
Wolf® Decking is a registered trademark of Wolf Home Products and is unaffiliated with CAMO® or National Nail Corp.
We are 100% employee-owned and our growth is directly related to the demand our customers have for our products. We value transparency and participation, and have a strong bias toward innovation, accountability and growth that makes our customers better financially, relationally, and executionally – an experience our customers won’t find anywhere else. We follow eight positive traits in everything we do: Servant Leadership, Integrity, Sound Judgement, Courage, Curiosity, Discipline, Energy-Giving and Mentoring Others. We strive to create unique experiences to ensure that your story is better and for us, it’s a privilege to be a part of it. We are always seeking people who share these traits. GRAND RAPIDS, MICH. – Following the 2013 NAHB International Builders’ Show, National Nail Corp.’s CAMO Marksman Pro-X1 was included in LBM Journal’s Editors’ Choice Hot Products section in the March 2013 issue. This year, LBM Journal showcased over 30 products and services that were featured at the 2013 NAHB International Builders’ Show. They highlighted new products, as well as existing products that have been improved to better serve builder, remodeler and homeowner customers. The CAMO Hidden Deck Fastening System was also included in LBM Journal’s 2011 Editors’ Choice Hot Products, after launching at the International Builders’ Show. For more information about CAMO, please visit http://www.camofasteners.com or call 1-800-968-6245 ext. 2134. Be sure to “Like” CAMO Fasteners on Facebook and keep up with CAMO news, stories, photos and events by signing up for the CAMO Connection on the CAMO website. 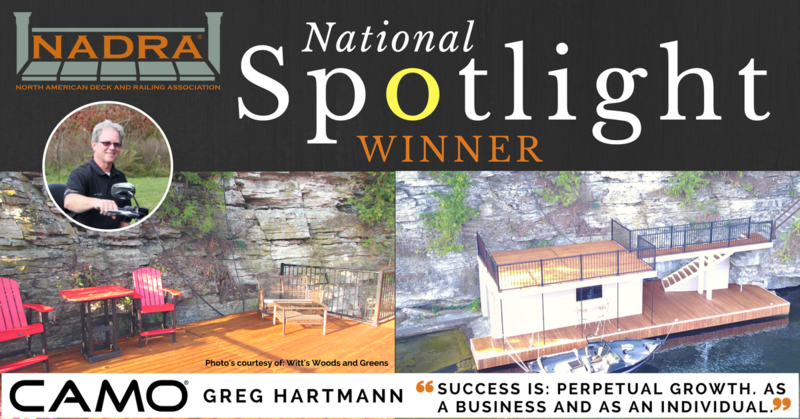 National Nail Corp., headquartered in Grand Rapids, Mich., is an employee-owned manufacturer and distributor of high quality, innovative building products and service solutions for the residential and commercial construction industries. Other National Nail brands include Pro-Fit® Fasteners, STINGER® Cap Systems and Impressions Storm Doors and Windows.